This 48-page pamphlet by one of Hawker’s successors provides interesting reading. 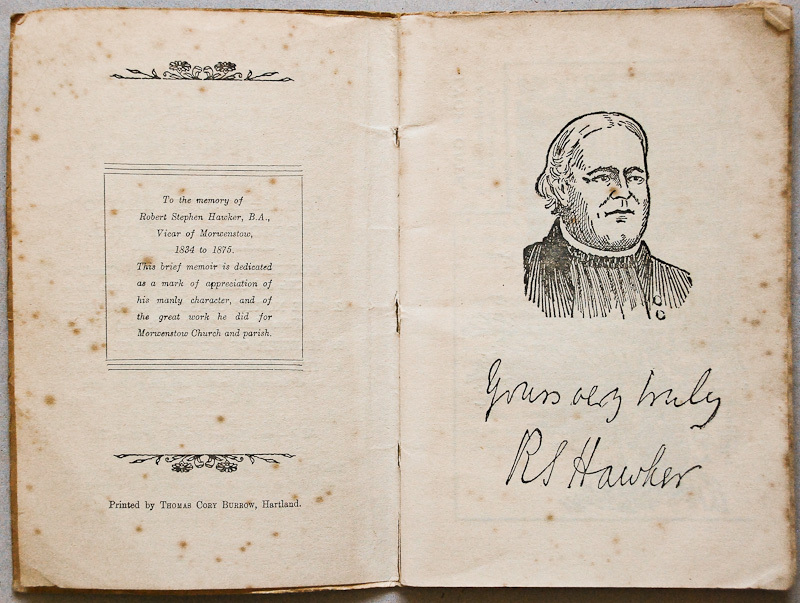 Hugh Breton was installed as vicar of Morwenstow in 1923, and was therefore able to collect some of his information from people who had known Hawker. The printer, Thomas Cory Burrow of Hartland, was the son of a Morwenstow man whose family still owned his certificate of Confirmation ‘with Hawker’s bold signature’. Burrow seems to have been an enterprising character: he built his own press and in 1896 began printing the area’s first monthly local newspaper, the Hartland Chronicle. 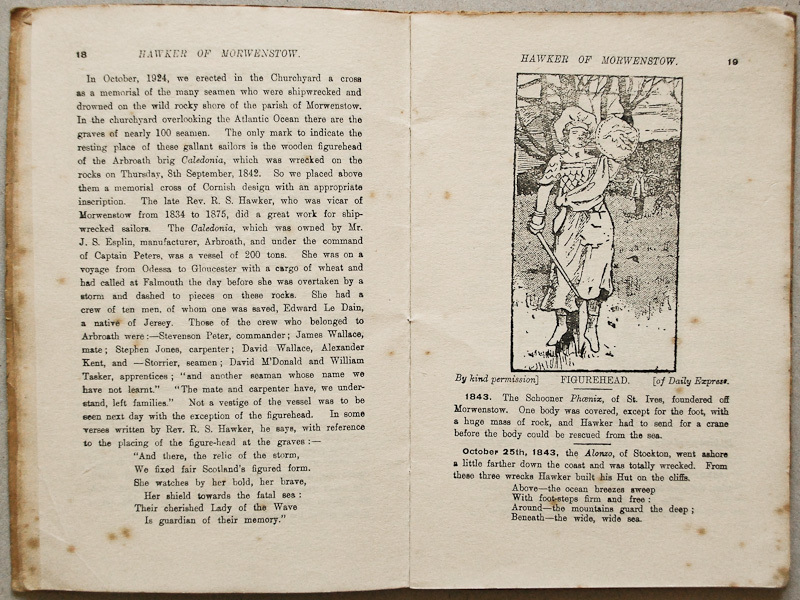 He also produced the first edition of R. Pearse Chope’s The Story of Hartland. His father was a carpenter and is mentioned in one of Breton’s anecdotes about Hawker in this book. Although Breton’s pamphlet is probably the liveliest short account of Hawker’s time in the parish, several other works deserve a mention. 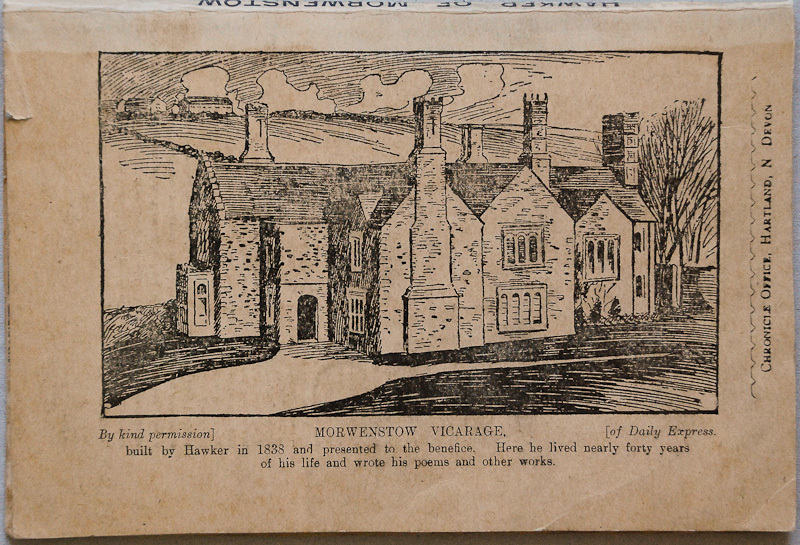 An attractive little book, The Story of Morwenstow, by John Tagert’s daughter, Mary Tagert, is illustrated with a number of black and white photos and turns up from time to time on AbeBooks. I’ve been able to obtain two copies: an early undated one inscribed ‘from K. Waddon Martyn, Christmas 1919’, and a fourth edition dated 1929. 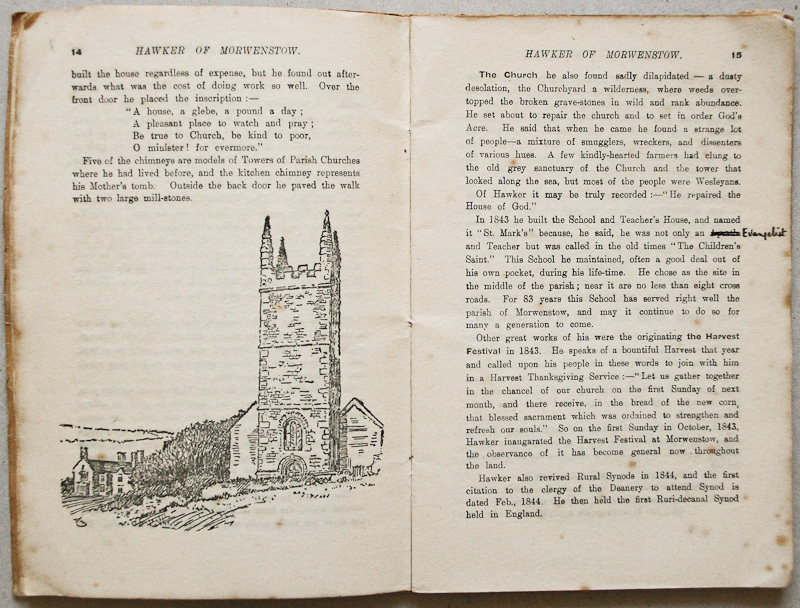 Frederick Conrad Hamlyn’s book Morwenstowe Since Stuart Times or A History of Morwenstowe After the Restoration is a much more substantial work which devotes a chapter to Hawker and provides an interesting and comprehensive account of the parish but is quite hard to get hold of. 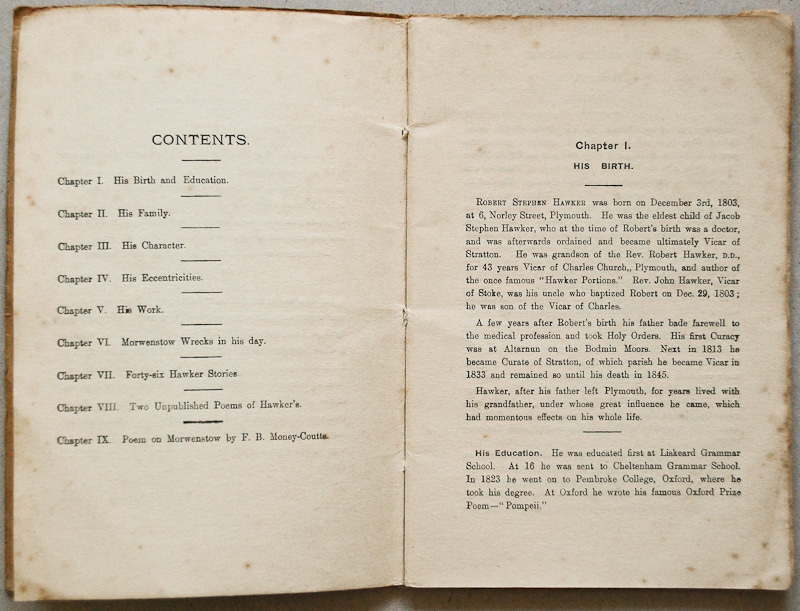 Hamlyn also published A Selection of R. S. Hawker’s Cornish Ballads on Local Topics, a tiny stapled booklet with a nine-page introduction which is more commonly available. John Robert Thomson, M.A., from 25 January 1876. John Tagert, B.A., from 4 April 1876. Herbert Lynne-Jones, from 15 May 1905. Henry Hugh Breton, M.A., from October 1 1923. Frederick Conrad Hamlyn, L.Th., from 24 May 1927. 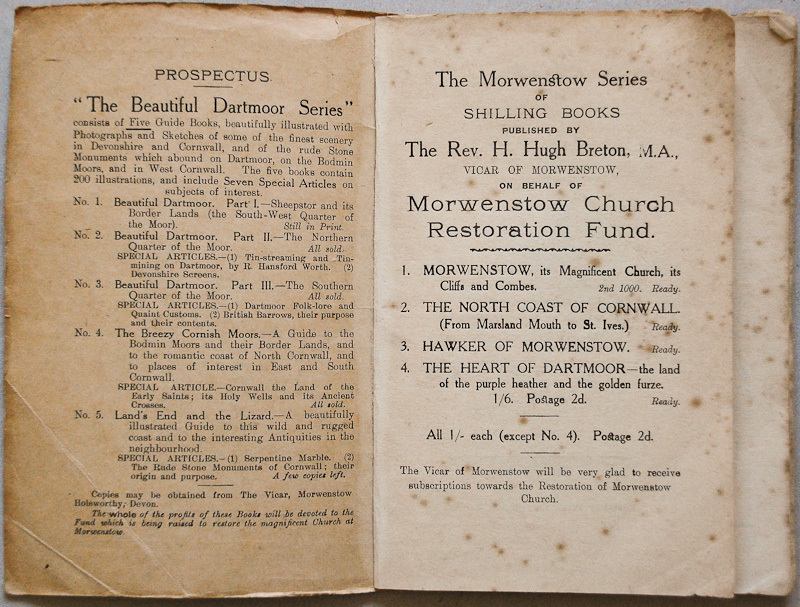 Breton came to Morwenstow after a spell as vicar of Sheepstor, where he had already published five small volumes to raise funds for the restoration of the rood screen. 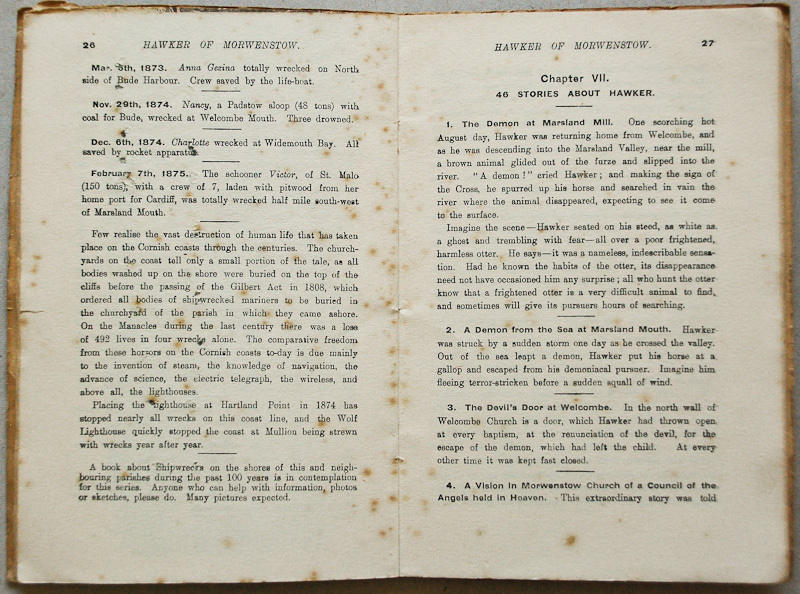 Pages 16-26 are devoted to a list of ‘wrecks along the coast in Hawker’s day’, which looks as if it may have been taken from C. F. Crofton’s Bencoolen to Capricorno: a record of Wrecks at Bude, 1862 to 1900. Breton adds in a footnote that he is contemplating a further book ‘about Shipwrecks on the shores of this and neighbouring parishes during the past 100 years. […] Many pictures expected.’ but unfortunately he doesn’t seem to have got around to publishing this. The ‘Forty-six stories about Hawker’ have a random quality which adds to their appeal. Hawker’s reputed love of cream gets a mention, along with the names of his horses, but item number 46, ‘The abominable scandal of Hawker becoming a pervert to Rome’ is by far the longest section. According to Breton the conversion to Catholicism never took place, but despite this firm conviction he was even-handed enough to include a letter from Hawker’s man-servant, John Olde, which suggests that it did (see below). 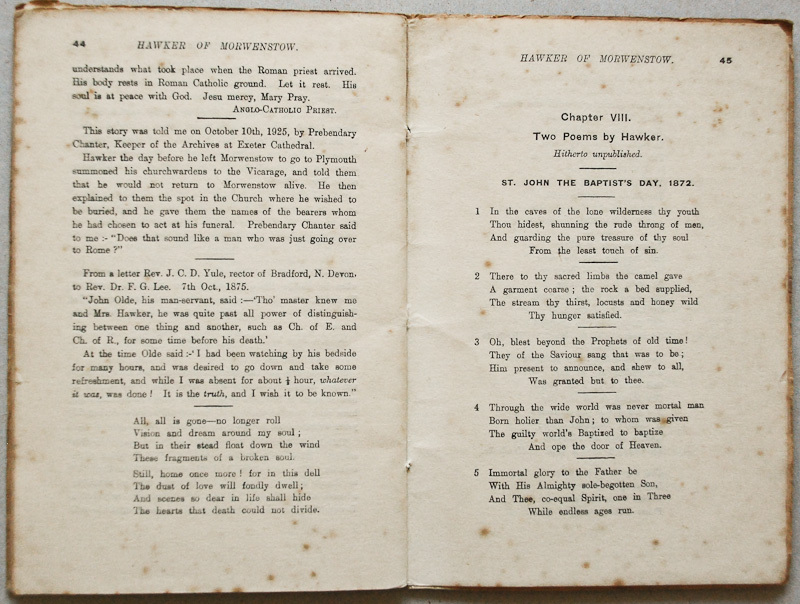 The full text of the two previously unpublished poems by Hawker can be read in the PDF version (see link above). Neither is especially impressive – they read like drafts Hawker himself might have rejected, though the second one has a bouncy rhythm which may owe something to his habit of composing on horseback. 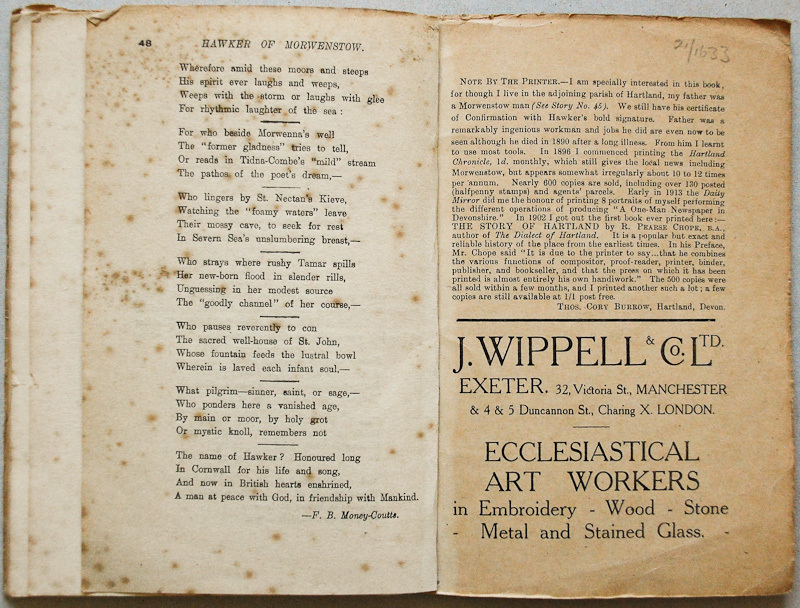 The final poem in the book was written by Francis Coutts, for the occasion of the dedication of a memorial window to Hawker on September 8th, 1904. Beautiful Dartmoor, Part I – Sheepstor and its Borderlands (the South-West Quarter of the Moor). Plymouth: Hoyten and Cole, 1911. Beautiful Dartmoor, Part II – The Northern Quarter of the Moor. 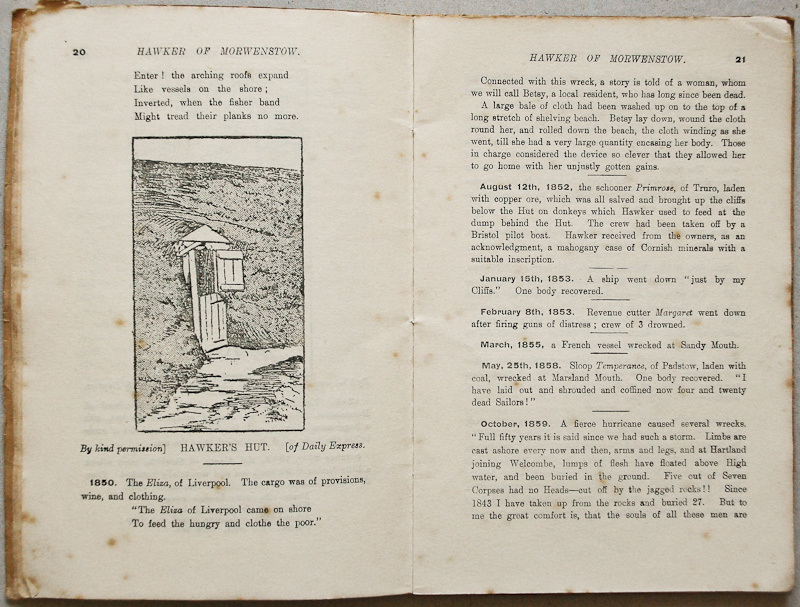 Special Articles: (1) Tin-streaming and Tin-mining on Dartmoor, by R. Hansford Worth. (2) Devonshire Screens. Plymouth: Hoyten and Cole, 1912. Beautiful Dartmoor, Part III – The Southern Quarter of the Moor. 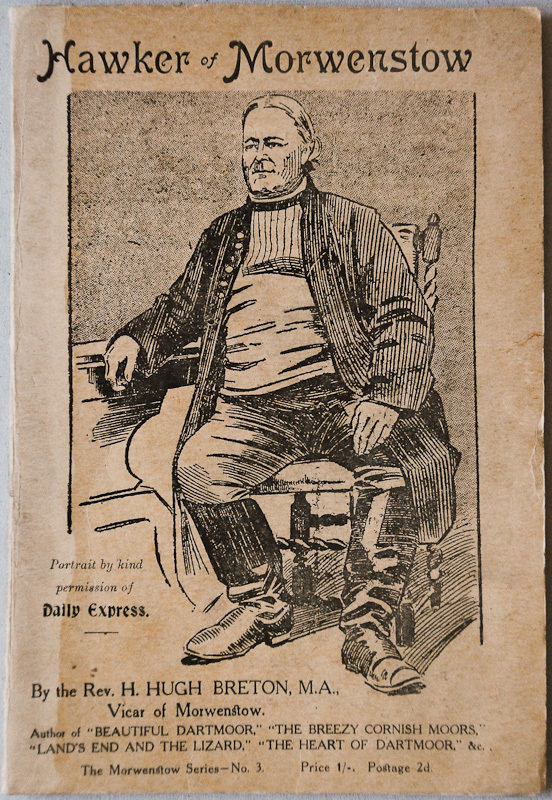 Special Articles: (1) Dartmoor Folk-lore and Quaint Customs. (2) British Barrows, their purpose and their contents. Plymouth: Hoyten and Cole. 1913. The Breezy Cornish Moors – A Guide to the Bodmin Moors and their Border Lands, and to the romantic coast of North Cornwall, and to places of interest in East and South Cornwall. Special Article: Cornwall the land of the Early Saints; its Holy Wells and its Ancient Crosses. No date available. Land’s End and the Lizard – A beautifully illustrated Guide to this wild and rugged coast and to the interesting Antiquities in the neighbourhood. Special Articles: (1) Serpentine Marble (2) The Rude Stone Monuments of Cornwall; their origin and purpose. Plymouth: Hoyten and Cole, 1912. The first three volumes of this series were republished in 1990 as Beautiful Dartmoor and Its Interesting Antiquities, a combined facsimile edition by Forest Publishing. Morwenstow, its Magnificent Church, its Cliffs and Combes. No further information available. The North Coast of Cornwall (From Marsland Mouth to St. Ives). No further information available. Hawker of Morwenstow. 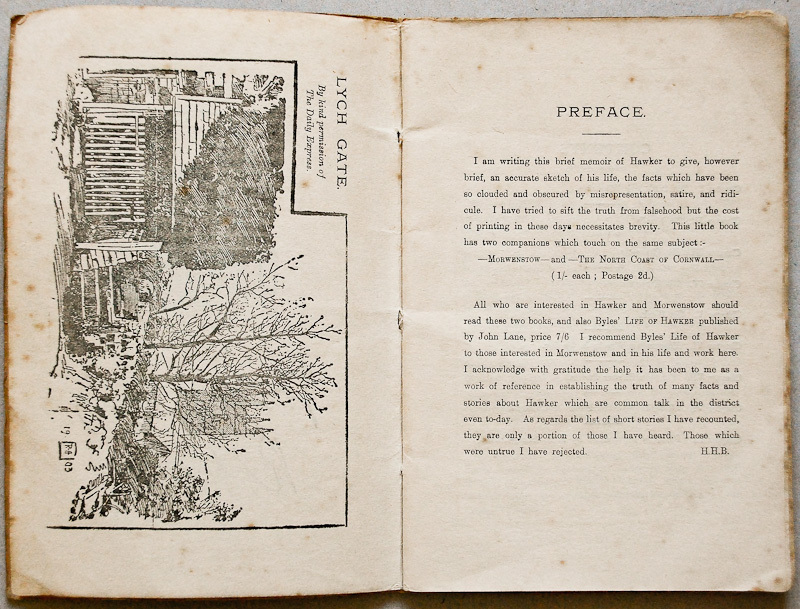 Printed by Thomas Cory Burrow, Hartland, Devon. No date, probably 1926. The Heart of Dartmoor – the land of the purple heather and the golden furze. Plymouth; Hoyten & Cole, No date, probably 1927. The Great Blizzard of Christmas 1927. Its causes and incidents. With a comparison to other great snowstorms in England between 1795 and 1927. Hoyten and Cole, Plymouth, 1928. The Great Winter of 1928-29. With accounts of the unprecedented snowstorm at Dean Prior on February 16th, 1929, and the great ice storm of the end of February, 1929. 1930. Spiritual Lessons from Dartmoor Forest (Part I) – “White Heather” and other studies. Hoyten & Cole, Plymouth, 1929. Spiritual Lessons from Dartmoor (Part II) – “Crystal Streams” and other studies. Ridouts Limited, Whitstable, Kent, 1930. Both volumes republished in 1990 as Spiritual Lessons from Dartmoor Forest, a combined facsimile edition by Forest Publishing. 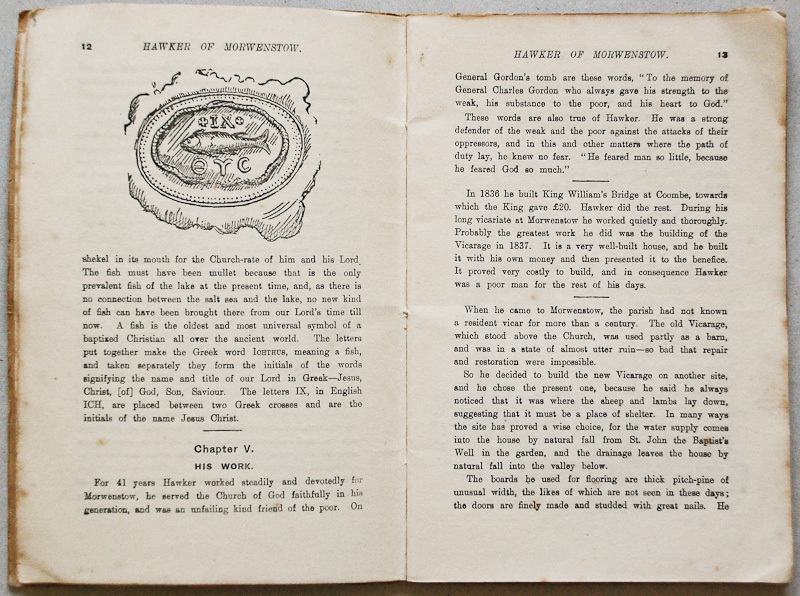 The Word Pictures of the Bible (Parts I and II). 1929 and 1930. The Forest of Dartmoor, Part I – South-East. With some Ancient Records of Dartmoor Parishes and of Dartmoor Worthies. Hoyten & Cole, Plymouth, 1931. The Forest of Dartmoor, Part II – South-West. With some Ancient Records of Dartmoor Parishes and of Dartmoor Worthies. Hoyten & Cole, Plymouth, 1932. Intended to be the start of a projected four-part series covering the South-east, South-west, North-east and North-west corners of the moor, but the final two parts were never completed due to Breton’s failing health. 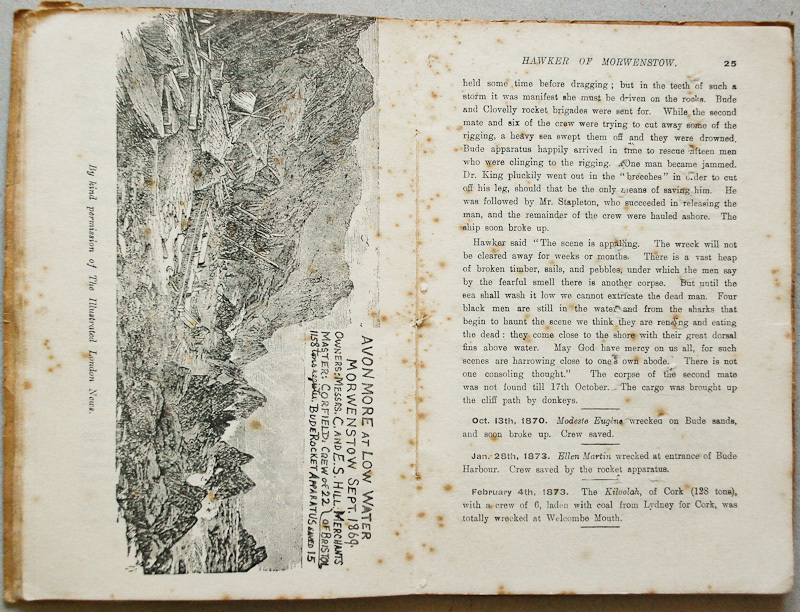 Parts I and II republished in 1990 as The Forest of Dartmoor, a combined facsimile edition by Forest Publishing.